First and foremost, I’m fine… this time. Being blind, there are a few additional hazards which present themselves along the way of my day to day. One of these is the delivery package as illustrated in our photo. 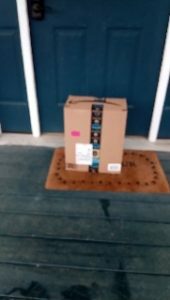 I was home at the time of the delivery but it is becoming more rare for delivery people to take the time to knock or ring a bell. Perhaps they are on a time crunch from their company or of their own making. It is also perhaps this same rush which results in their not observing the delivery instructions which we’ve added: “Blind occupant, please place package to the side of the door!” I suspect there might even be well intentioned thoughts of placing this very visibly in front of the door to be easy for the newly arriving home. Unfortunately for me, when I’m in the house and step outside without any awareness of the obstacle, there is a real danger for me. Several near misses prompted our specialty instructions, but this time as I took Autumn out on leash for a relieve, I spun at the door to keep her paws safe of the closing door and turning to find my top step I bumped the package which tripped me and fell into my path for advanced tripping. Falling onto the steps, I barely evaded landing on Autumn and bruised my hip and shoulder. My injuries were not severe this time, but it was close. I followed up with the delivery company and they apologized profusely and made a commitment it would never occur again. It has happened enough times in my world that I will try to stay on guard as much as possible. I try to be aware, but it is difficult to be on our guard at all times and especially in the places we presume a little comfort from the known quantity of being our homes. The simple reality is all of us have the opportunity to be a little more present and aware as we go about our day to day. Certainly there are times something calls our focus away with enough importance for us to warrant it in our priorities. This can quickly fall into patterns and habits of inattentiveness and we might rush through our lives missing many worthwhile details–in the case of my delivery persons, those instructions or even the courtesy knock being high on that list. In the case of a text message while driving, how many far more deadly results?